Why Choose Bay State PT? Chris graduated from Northeastern in 1989 and has been with BSPT since 2004 as managing partner of Cedarville. He prefers using a combination of manual therapy, modalities, and exercise to treat a variety of post-surgical and orthopedic cases. 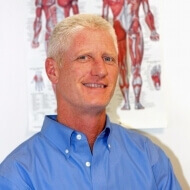 He has been trained in Myofascial release and Cranial Sacral therapy, and finds them useful in treating headaches, neck and back pain, and a variety of other conditions. Chris sees a wide age range of patients, including many of the local high school and college athletes as well as patients who are unable to take time off from work. His flexible schedule allows better accommodation for his patients’ schedules. Chris enjoys both snow and water skiing and has 5 children, 2 dogs, and 7 chickens.